It is the beginning of the journey to state for the Penn Girls Soccer team, and 266 girls teams have been paired for the Sectional tournaments. For the Penn Girls Soccer team, the Sectional tournament is the beginning of a journey, and PGS has been able to win the sectional championships the past six years. For the girls, the 2016 state tournament will start off at South Bend’s Jackson Field in the Sectional 6 playoff against South Bend Adams, on Thursday, Oct. 6, with a 5 p.m. kickoff. 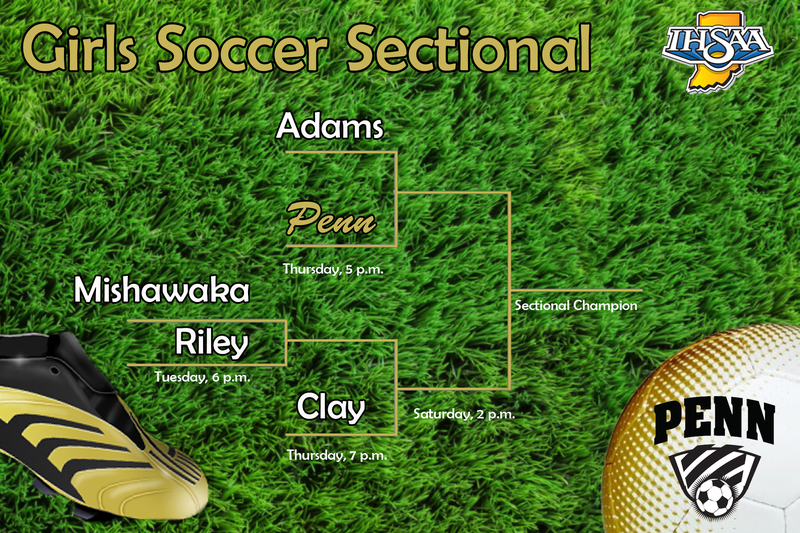 If the Penn Girls can bring home the win, the Sectional championship will follow on Saturday, Oct. 8, with a 2 p.m. kickoff. Penn girls soccer is ranked first in the state and are last year’s state runner-up. This year will be the battle for a state title for the girls. Coach Jeff Hart has high hopes for his players. “We are excited to enter the post-season healthy and with all of our team goals still achievable,” Hart said. “We also take our program’s motto of ‘One Game at a Time (OGT)’ very seriously. We talk about the suddenness of the season ending if we don’t prepare and focus for each team and each game ahead of us. If the squad is able to keep its focus on the game in front of them, come the state game they could be there competing. After the Sectional, the Regional tournament is scheduled for Wednesday, Oct. 12, at 5:30 p.m. at Goshen. The Regional championship will also to be held at Goshen at 2 p.m., on Saturday, Oct. 15. The semi-state will be held on Saturday, Oct. 22, at South Bend St. Joseph at 12 p.m. The State Finals will be held at Carroll Stadium in Indy, with a 12 p.m. kickoff on Saturday, Oct. 29.